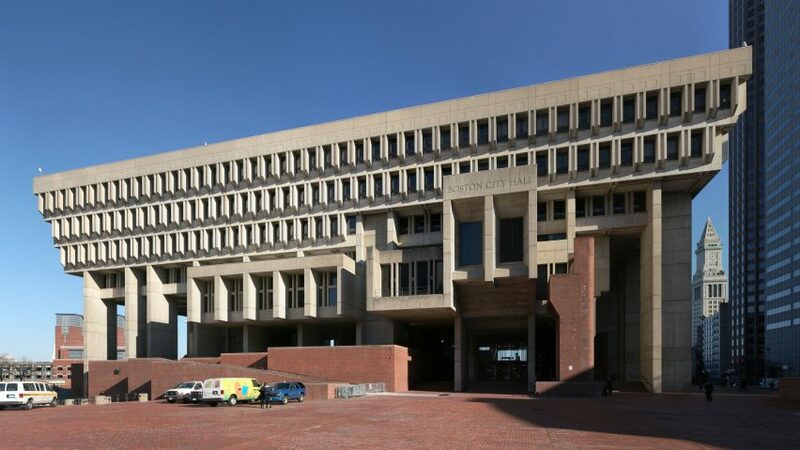 Opinion: "Boston City Hall is the frog waiting to wake up as a prince"
As the brutalist Boston City Hall celebrates its 50th birthday, Aaron Betsky reflects on the building's history as a monument to social democracy, and wonders if proposed updates will bring it a happily ever after. Let me tell you a fairytale. There once was an era in which government was something we admired. What's more, architecture was able to both represent and house the collective power that made us better and stronger. That era ended half a century ago, on or about 1968 – the year that American youth rebelled, the Vietnam War revealed its pointless evil, Richard Nixon was elected, and the Boston City Hall opened. I write this as the government is still shut down and the celebrations of the 50-year anniversary of Kallman, McKinnel, & Knowles' masterpiece is marked by efforts to rehabilitate it into a useful, softer-edged container of civic functions. Those dreams of restored grandeur seem like a romantic effort of backward-looking nostalgia in the deep-blue state of Massachusetts. In this fairytale, the Boston City Hall is less of an ogre that it has seemed to many people, including one of its mayors, than the frog waiting to wake up as a prince. The kiss will consist of planting trees on the outside and freshening up the interiors – moves that are logical, but also counter to what makes the building such a statement of the civic. Here is the basic problem: it's not just the City Hall's style or its amenities, but how we understand the institutions that we elect and pay for. We assume the powers we delegate to them will make them able to act for us not as individuals, but as members of a community. For most of history, we understood this to mean that those governments we elected through a democratic process should maintain their sense of being above and separate from us. They were large organisations and needed big buildings, which meant that they would have a scale and a separateness that was inevitable. Their homes also needed to be imposing, worthy of our respect, obedience, and even awe. The particular moment that gave us such structures as the Boston City Hall came at the end of this era, when the doubts about governments all-knowing, all-powerful nature were beginning their march through our institutions. The reaction of architects was to find ways in which governments could rely on logic, function, and even economic constraints as the building blocks for a new kind of monumentality. Civic architecture stripped itself down and bulked itself up. In this case, the architects' knowledge of classical architecture allowed them to provide a frieze that was not an added element, but the result of how the organised the windows and their sun-shading concrete panel frames at the building's top, while the way in which the building cantilevered out over the plaza was the result of how many square feet the offices inside needed. The mayor's office, which demanded extra scale and waiting areas, became an interruption in the grid, as did the other specialised elements in the municipal bureaucracy. Perhaps the greatest of Kallman, McKinnel, & Knowles' achievements here, and the one that will luckily be left alone (beyond the proliferation of security devices such as card-reader gates that have already been installed) is the interior lobby – a space that continues the plaza outside into the heart of the complex. Organising all the public functions around it, and leading visitors and workers up through the tiers of offices and specialised spaces on stairs that turn past balconies and protruding parts of the programme, it is not so much an atrium as it an extension and monumentalising of the simple function of circulation. The dome of democracy has become a maze that might get you lost but might also provide chances for encounters and discovery. All of this takes places in a building that is grid, with concrete elements that impose themselves on you, making you aware of the ways in which the whole comes out of many different elements, while letting you understand the effort needed from the concrete columns and beams to make the whole building stand up. The civic effort is thus collective, but made out of supporting parts, and you can wind your way through what is your palace while feeling the weight of the community in which you have your place. The building juts out over you, extends up, invites and repels you – but you are part of its activities in the combat of civic forces. The problem is that all of this architecture has to exist in a city, and that many people – the bureaucrats who work in the building – have to exist in it every day. On both counts, Kallman, McKinnel, & Knowles' design strategy did not work very well. Isolated and grand in scale, the City Hall is yet overwhelmed by the much larger office buildings, while the life of the city has never come close to its edges (the architects intended for shops and restaurants to inhabit the plaza, but local businesspeople nixed that aspect of the design). Inside, what elegance there was to the office furniture and accoutrements has long since worn off, and we can only hope that the renovation will improve their ability to make the spaces more habitable. The question remains as to why Boston City Hall remains both so popular and so loathed. While the latter is easy to answer, because it is just not a very friendly or humane building, the latter is more difficult. We do not feel much ownership of our government these days. We tend to be cynical about how much say we have in its operation. Our governments' ways of operating are also, like those of corporations, increasingly less physical. We do much of our business with them online, even down to voting. Perhaps the latter is a clue to how these remnants of civic pride can operate. It can provide and equivalent of the lavishly appointed flagship stores that are often empty both of goods and buyers but serve as brand showcases. Such buildings represent what government stands for, even if they are not functional in the way they were designed, and even if the very act of representation is not direct. Boston City Hall, in other words, stands for a power that accrued over the centuries, and that we want as a bulwark against uncertainty and the basest of our instincts. Like all monuments, it is both a reminder and a fact on the ground that stands, endures, and offers itself as an object in a subjective and confusing world. The fact that the Boston City Hall bears the scars of the looming fight for the legitimacy of government, and massed itself up into weightlifter form to answer the doubters assailing it, only makes it more powerful. It is one of the last concrete examples of government willing to fight for what it thinks is right, which is, or should be, or common good. Winter might be coming, but we still have a few castles that can rally the troops of democracy. Main image is by Daniel Schwen, from Wikimedia Commons.